Blue and white is a color combo I will never ever get tired of wearing! I purchased this striped skirt a couple months ago and was trying my hardest to hold out and not wear it until spring, but I just c o u l d. n o t. w a i t. The striped pattern and layered pockets are too cute, and I couldn't resist wearing it sooner! To make this skirt better fit for winter (and the cooler weather), I wore this white turtleneck, these wedges, and this classic coat for extra warmth! I also wore these statement earrings for an extra pop of color around my face. I stuck to a simple color palette, blue, white, and black, because I really wanted this skirt to be the focus of this outfit and not take away from the skirt's classic design. 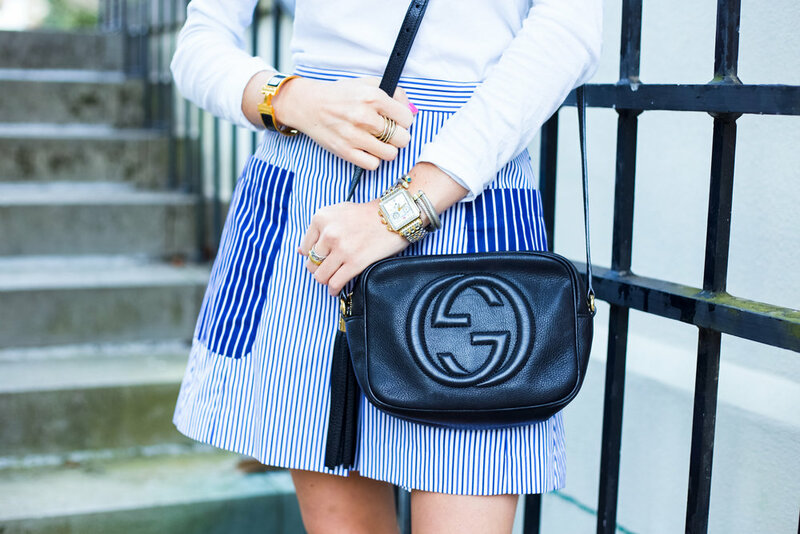 Not only is this skirt one of my favorite color combos, blue and white, but it's also my favorite pattern- stripes. If you are not familiar with the MDS Stripes brand yet, you need to be! Mark Sikes, a well known and accomplished interior designer (get to know him here!) started a really chic, stylish, and classic women's fashion line a few years ago, and I have been so in love with all his designs ever since it launched. From dresses to tops to accessories and everything in-between, the MDS Stripes brand has taken striped clothing to a whole new level and created such a beautiful collection of womenswear pieces perfect for everyday wear as well as special occasions. I love all the extra details in his collection like big bows and bold ruffles. I really really admire and respect that every MDS Stripes item is made out of 100% cotton in California! I love supporting brands that are not only designed in the USA but made here as well! As spring approaches, keep your eye out for all the pretty MDS Stripes new arrivals here! I'm dying to add one of their maxi skirts, like this one, to my closet.